Source: CoolTek/Heat Relief Products Int'l, Inc. Stylish headwear available in a variety of colors. Simply soak in tap water for 5 minutes, wring out excess water, wipe the inner lining and wear. Hats weigh only 4 oz. dry and less than 8 oz. when activated. Activates in less than 5 minutes. Provides heat relief comfort for up to 8 full hours. Adjustable back tabs (on ball cap) for a perfect fit. 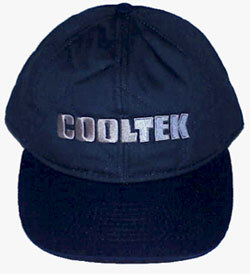 CoolTek/Heat Relief Products Int'l, Inc., 1991 Crocker Road, Suite 600, Cleveland, OH 44145-1962. Tel: 440-892-3336; Fax: 440-899-7208. CoolTek/Heat Relief Products Int'l, Inc.